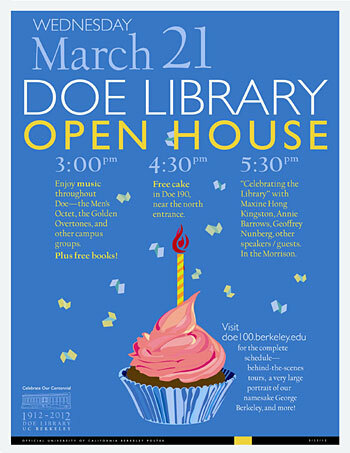 UC Berkeley’s Doe Library is throwing itself an open house on Wednesday (March 21) to celebrate the 100th anniversary of its founding and to offer a glimpse of its future. The event is free and open to the public. Areas of the library rarely open to the public will be available for exploration, and a special exhibit showcasing Doe’s history — The “Heart of the Campus: Doe Library 1912-2012” — is in the Bernice Layne Brown Gallery at Doe’s north entrance. Opened during the 1911–1912 academic year, Doe Library quickly became the campus’s scholarly and architectural centerpiece. Today, the building designed by John Galen Howard is a national landmark and holds about 2.5 million volumes, in more than 400 languages. More details about the Doe centennial are online. Explore normally closed parts of the library, including the Preservation, Conservation, and Treatment Department, Newspapers/Microforms storage area and Data Lab. In addition to the “Heart of the Campus” exhibit, view millions of books in the Gardner Stacks, the recently restored North Reading Room and Heyns Reading Room and a portrait of campus namesake Bishop Berkeley on display in Heyns. Listen as Doe librarians discuss the library’s history and special collections; tune in to the California Golden Overtones, University Chamber Chorus, the UC Men’s Octet and Cal Band; or watch a traditional Sundanese (West Java, Indonesia) dance performance. Free birthday cupcakes will be served in Room 190. UC Berkeley Chancellor Robert Birgeneau will join novelist and English professor Maxine Hong Kingston, linguist Geoffrey Nunberg of the School of Information, Berkeley alumna and author Annie Barrows and Associated Students of the University of California President Vishalli Loomba for tributes to Doe Library and its treasures.